Echidnas (Tachyglossus aculeatus), or spiny ant eaters as they are sometimes known, are familiar to most Australians. 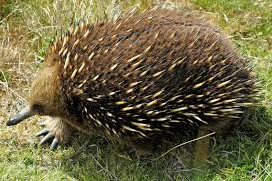 Echidnas are monotremes (mammals that lay eggs). There are only three species of monotreme in the world -- the platypus and two species of echidna, one of which is restricted to the New Guinea highlands. They have many features which are reptilian in nature such as egg laying, legs that extend outward then downward, and a lower body temperature (about 31-320C), than other mammals. The echidna is shy and moves slowly and carefully, but can usually be approached by treading softly. It is solitary for most of the year but at mating time several males may follow a female. Their activity patterns differ with location and temperature -- in the warmer parts of Australia it is completely nocturnal, spending the daytime resting out of the heat. They typically shelter in rotten logs, stumps or burrows, or under bushes. In more temperate areas foraging occurs around dusk, while echidnas in southern Australia are often active during the day, particularly during winter. If disturbed, echidnas will usually lower the head, and with vigorous digging, sink rapidly into the ground leaving only the spines exposed. On hard surfaces they will curl into a ball -- presenting defensive spines in every direction. They are also capable of wedging tightly into crevices or logs by extending their spines and limbs. Echinda Hind FootThe echidna is adapted for very rapid digging, having short limbs and powerful claws. The claws on the hind feet are elongated and curve backwards; to enable cleaning and grooming between the spines. However, despite this, they are infested with what is said to be the world's largest flea -- Bradiopsylla echidnae, which is about 4 mm long. Echidna footprintsMale echidnas, like their relative the platypus, have a spur on each hindfoot. However, unlike the platypus the spur is blunt and the venom gland is not functional.